You know those commercial water slides you find in water parks? Ever dreamed of having a smaller version of one of those in your back yard, community pool, or lake house? We make that dream come true! We reconfigure & refurbish the sections so they look like new. Using recycled commercial slides, we create unique, one of a kind water slides going into pools, ponds & lakes. You will never get bored of this! We remove, refurbish, redesign & reconstruct old Water Slides. Working with Engineers landscape architects & pool companies we take large slides out, break them down, refurbish them, & create smaller cool slides! This creates a viable product for smaller Water Parks, Summer Camps, Municipal Pools, & Private Summer Homes & Residences. We take apart and remove old faded water slides from large water parks as they make room for new ones. Instead of dumping the slides into a landfil we recondition and recoat them to make then new again! Not your 7” plastic pools slide - you get the same thing you see in the parks! We repair the fiberglass surface of the slide patching any holes or dents and smoothing out any bumps and bubbles. Our fiberglass refurbishing process leaves the slides as solid, strong, and SAFE just like day they were made. If you can dream it, we can build it. Any color, any length, any configuration. Since the big park slides are made up of small standard size parts you can configure them in an infinite number of ways. How about a smaller 30ft slide from your deck into your pool? Or a 300ft slide that zig zags from your back door, around your property, underground, over your deck, and into your lake. Yea we can do that too - in ANY COLOR! 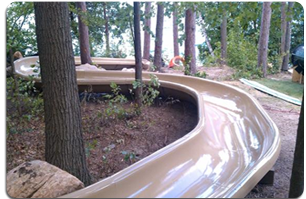 These are commercial grade fiberglass water slides! They are not little plastic pool slides. After we go through them restore & refurbish them, Boom, new slide! You are adding value to your property, these slides are an asset. Lets all hold hands & group hug! 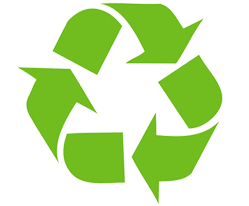 When you get a slide you’re not only going to have so much fun, you’re also going to feel great doing it because you’ll know your slide is totally recycled and together we saved thousands of pounds of plastic and fiberglass from going into a landfill. We are a small company making a difference one section at a time. They are really Fun, very cool & another good reason never to leave your property!